'C'est un homme d'intrigue, d'une grande immoralité, mais avec beaucoup d'esprit, et certes, le plus capable des ministres que j'aie eus', Napoleon to Caulaincourt during the retreat from Russia, 1812. Born Paris, 2 February 1754 – died Paris, 17 May 1838. 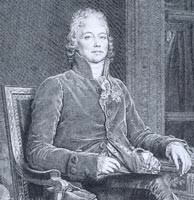 Initially a cleric, Charles-Maurice de Talleyrand-Périgord was chaplain in the parish of Saint-Pierre-de-Reims in 1775, in which capacity he was present at the coronation of Louis XVI. Made Abbot of the wealthy monastery of Saint-Rémi-de-Reims, he was ordained priest in 1779. However he sent more time in Paris (rue Bellechasse) than at his abbey, devoted to his two passions, gambling and women. After the intervention of his father in 1788, the king made him bishop of Autun, thus giving him a seat in the Estates General. There he sponsored the idea of ceding clergy property for national use. In 1792 he became a diplomat, and after residences in London and the United States the Directory appointed him Minister for Foreign Affairs. Supporting Bonaparte in the Brumaire coup d’état, he resigned in July 1799, ready to be reinstated in the same post in November by the then First Consul. He oversaw the writing of the Concordat of 1801. In 1802, Pope Pius VII removed his excommunication and permitted him to marry Mme Grand. In 1801 he negotiated the Treaty of Lunéville with Austria. In 1802 he held negotiations with Britain, as a result of which Bonaparte signed the Peace of Amiens, putting an end to the Second Coalition. On becoming emperor, Napoleon appointed Talleyrand as Grand Chambellan, in which capacity the chamberlain was to attend a second coronation. Ennobled to Prince of Benevento on 5 June 1806 he participated in the parley after Austerlitz in the run up to the Treaty of Pressburg. Finally in 1807 he negotiated the Treaty of Tilsitt with Russia and made his first contacts with Alexander Ist. It was at this point that his political life reached a significant turning point. He thought that the time had come for a general peace in Europe and a rapprochement with Austria and Britain. Napoleon disagreed and this led to Talleyrand handing in his resignation. But in recognition of his services, he was made one of Napoleon’s advisors and vice-Grand électeur. After seven years o f se mi-retirement, in 1814 he decided that the time was then ripe for the return of the Bourbons. And so, on Talleyrand’s advice (and despite Napoleon’s orders), on 28 March the Empress Marie-Louise and the Roi de Rome were removed from Paris. Already by the 31st, Talleyrand was receiving the Tsar with a view to persuading him of the necessity of the return of Louis XVIII. Named head of the provisional government (drawn up by the Senate in agreement with Prussia and Austria) on 1 April, and with Napoleon’s fall announced officially (2 April), he welcomed the Comte d’Artois, the king’s brother and had published in the press that ‘Nothing has changed for France. It is simply that there is one more Frenchman!’ As a reward for his services he was made Minister for Foreign Affairs. He negotiated the Treaty of Paris which Louis signed on 30 May – this returned France to its borders of 1792 with the addition of a few other territories. Representing France at the Congress of Vienna, Talleyrand in defending the legitimacy of Louis managed to split the allies, Britain and Austria siding with France against Prussia and Russia. A secret treaty between France, Britain and Austria reinforced his power. The Hundred Days threatened to ruin Talleyrand’s work. He pleaded once again Louis’ cause and signed a manifesto stating that ‘Napoleon was the enemy and disturber of the peace of the world’. Although relations between Louis and Talleyrand deteriorated slightly, Talleyrand was imposed upon Louis by the allies as Président du Conseil. But he was subsequently unable to get on either with the Tsar or the Comte d’Artois – d’Artois declared ‘Monsieur a fait beaucoup de mal’. The king charged Talleyrand once more with the task of defending France against the allies, allies who wished to occupy a part of French territory and to take certain strongholds seized by Louis XIV. But Louis was unhappy with Talleyrand’s performance and criticised his lack of foresight. In difficulty when faced with the election of the ‘Chambre i ntrouvable’, Talleyrand was then asked to begin peace negotiations. Pozzo di Borgo, Napoleon’s lifelong rival from Corsica and the then Russian ambassador, informed the king that only Richelieu could bring the negotiations to a successful conclusion. For this to happen, Talleyrand had to be dismissed. Sensing imminent disgrace, Talleyrand resigned. The Comte d’Artois, on becoming Charles X, made Talleyrand Grand Chambellan, in which capacity he once again was present at a coronation. Louis-Philippe charged him with his last diplomatic mission, namely to London where he worked for the rapprochement of France and England. Yvert, B. (ed. ), Dictionnaire des ministres de 1789 à 1989, Paris: Perrin, ‘Talleyrand-Périgord’, pp. 85-87. For a bibliography of works on Talleyrand, click here.